All champions are born but a lot of them are made through sheer persistence and hard work. We almost always associate champions with sports and that can be still a metaphor for life. Life is like a sport as we all face defeat, victory, setbacks and elation. There are certain traits champions have whether it is in business, sports or politics. Here is my analysis of the 9 traits that set the champions apart from the rest. They know their outcome: If you don’t know where you are going then any road will get you there. Unless you have defined the outcome you want in your life it is very difficult to get any momentum. All champions have clearly defined what success looks like to them. It may be a financial goal, physical goal or learning goal. Whatever it maybe they have taken the time to identify what they really want their end game to look like. They stay hungry: I often wonder how does a champion like Federer keep coming back even after achieving everything he has ever wanted and why some champions after one victory stop trying to win. The key is the hunger or desire to be the best in whatever they do. The key is the champions who are hungry try to be the best they can be. They want to be the best in whatever they do and they maintain that hunger. They create reasons to keep that hunger going. Once you know what your outcome is you need to know why you want it. This is the key to maintain that hunger to keep winning. They pay the price and engage in deliberate practice: Champions know that they need to pay the price for victory. They know that just to participate in the Olympics they have to nearly put 3000 hours of effort in four years. It is this ability to put in the hours that sets the champions apart from the rest. This is really inspiring from Michael Phelps and his dedication to hard work. His quote “People were taking breaks during and after the Olympics. I was working all the time. Six months later, I broke the world record… Sometimes my goggles broke in practice, that’s how intensely I pushed myself. So when my goggles fell off in the water at the Olympics, my mind went back to those moments, and I was ready… It’s what you do in the dark that brings you to light. It’s the stuff behind closed doors, the blood, sweat and tears.” Another example of a champion is Michael Jordan and in the book Relentless Tim Grover said Michael Jordan didn’t study the competition instead he made the competition study him. They are high on self-care: As documented in the wonderful book Peak Performance all top athletes like Deena Kastor not only push themselves full out but they also take of themselves really well. They sleep for at least 8-10 hours, they take time off and they do really take time to rest. So take the time to recover from stress. Use the weekends to really renew and rejuvenate. All champions see peak performance as a cycle. Go full out and then pull back. This is the only way to win the long game. They embrace failure: It doesn’t matter how great the champion maybe as all of them have to go through failure at some point of time. It doesn’t matter if it is Sachin Tendulkar or Roger Federer they all had failure. The only difference between champions and others is they embrace failure. They know that the only way to keep winning is to keep trying till you get what you want. As Churchill said “Success is not final, failure is not fatal: it is the courage to continue that counts.” So next time you feel like something has failed in your life just remember that all champions do encounter failure but they embrace it and use that as a launch pad to come back stronger. They compete against themselves: Champions don’t keep comparing themselves with others. Instead they try to be the best they can be. We have heard so many times that I wanted to better my record. That is the key to success. You need to keep trying to improve your best performance. If you give your best every day then there are no regrets and that is good enough reason not to compare with anyone else. Someone else’s success is not your failure. Everybody has their own unique potential and they can try to maximise theirs which is the best anyone can do. 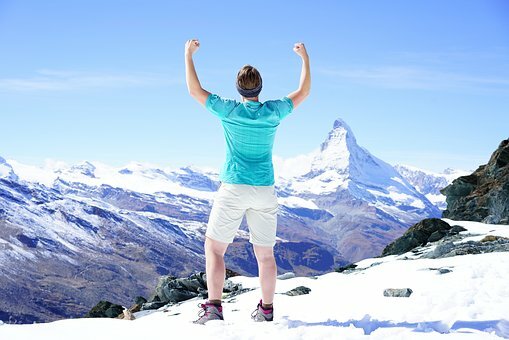 They find new challenges to stay motivated: Looking at champions who have achieved whatever they wanted the key is to keep trying to scale new mountains once they conquered one. So many champions may have won the gold medal but that feeling may last for a week or month. However they may have to wait for another four years for the next medal. So in the intervening four years they need to keep setting new challenges to stay motivated. They have a great support system: Looking at champions who have achieved whatever they wanted they all had a great support system. They had wonderful coaches or they had the best training gear. So the key is not only what you do when you are in arena but it is what you do off the arena that determines how far you go. For those who are not in sports this may mean having all the books you need to succeed, identifying all the experts in your field, connecting with them, listening to their podcasts, document what you have learned and share what you have learned. It may also mean having a supporting family who are always with you when things go awry. There you have it the 9 traits that set Champions apart from the rest. They keys are to define what you want, take action, stay hungry and never give up.